When you’re in the middle of a desert, the last thing that comes to mind is sushi, but I found a fine Japanese restaurant less than a block from T’s apartment complex. It seemed to be a stroke of luck. I had time to kill before T was off work and I wandered to the strip mall next to his complex and decided to see a movie. I needed something for lunch before my movie started and I had to choose between Thai and sushi. Luck was one my side as I sauntered into Rising Sun. 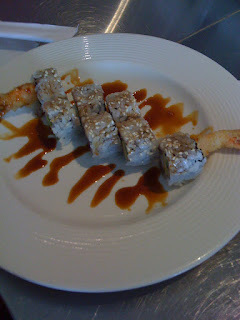 It seemed a little empty but that again turned out to be in my favor, as I took a seat at the sushi bar. I tried to order their stir fried dungeoness crab, but they didn’t have a fresh shipment. In retrospect that was great thing, I can’t imagine that old crab would have been too tasty. So, I had miso Chilean sea bass instead, and I couldn’t have been happier. 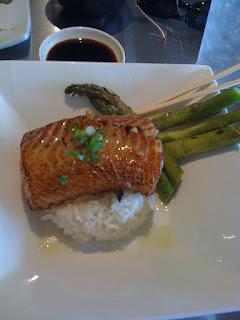 It was a delicious flaky fish with a sweet miso sauce, and the asparagus on the side….whoa, I couldn’t have eaten an entire plate of them. Now I wouldn’t call this meal a stroke of luck solely for those two dishes, it was lucky because of the loquacious head chef Tony and the gigantic board behind him. 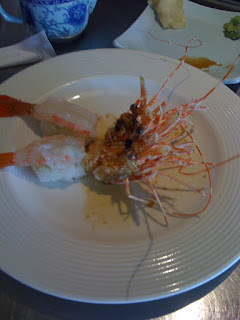 I had to ask about the live sushi section, particularly the ama ebi. Honestly, how often does a sushi bar actually have live seafood? 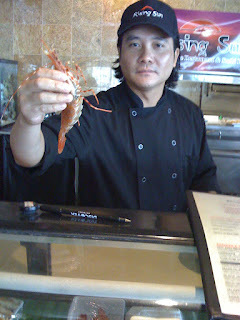 Tony explained that ama ebi was sweet shrimp that were pretty big, and had a subtle sweet flavor, hence the name. I knew I had to try some. Tony happily went and fetched a couple from the back, and was proud to show off his fresh materials. Now you can’t see it with the still picture, but that is a live shrimp, complete with flailing legs. It was quickly transformed into this. I’ve never had anything that fresh, and it was fantastic. Even though it had been a huge lunch, I had to try at least one more thing off the board. At Tony’s urging, I picked the kobe beef sashimi. 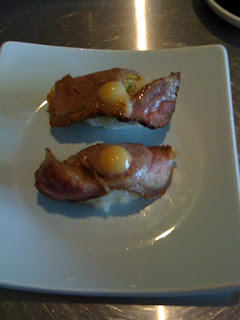 It was a perfectly seared piece of sirloin, finished with just a touch of “yum yum” sauce. It was a great way to end the meal. 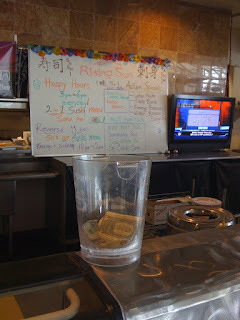 If you ever make it to Las Vegas, and happen to find yourself at the intersection of East Sahara and Fort Apache road, I urge you to pay Tony and Rising Sun a visit, you won’t be disappointed.